This page was written by Jen Aschoff as part of the DLESE Community Services Project: Integrating Research in Education. ]Mississippi Delta, Half-dome of Yosemite, Big Horn Mountains Laramide uplift and Australian coastline (analogous to the Cretaceous Interior Seaway).These images are in the public domain. What is the Cretaceous Collection? The Cretaceous collection contains an assortment of digital resources relevant to the Cretaceous Period (145.5 - 65.5 million years ago). These resources cover a broad range of topics and include an array of media types. A variety of images, maps, visualizations, virtual field trips, databases, technical papers and general information are among the resource types found here. The Cretaceous collection was created to allow students and teachers alike to explore the complex relationships between physical Earth, changing climate and sea level, biota (evolving and extinct), and implications for modern society that are related to this amazing period of Earth's history. Museum of the Rockies scientist in the mouth of a Torosaurus skull model. Provenance: © Museum of the Rockies, photograph by Celeste Horner. 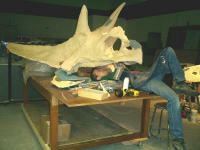 The Cretaceous Collection was designed primarily for undergraduate and graduate level instructors and students. However, many of these useful resources are valuable teaching/learning tools for K-12 instructors, students and the general public alike. Suggestions for learning about the Cretaceous in an earth system context. Use our handy search tool to quickly locate relevant information by subject area or type of resource (map, activity, etc). Web resources are arranged in a topic-based hierarchy. Compelling questions about the Cretaceous Period are presented, along with embedded links for students to discover and synthesize new information. What is the nature of the K/T boundary, and how is it related to the extinction of the Dinosaurs? What was the Cretaceous superplume event, and what effects did it have on the Cretaceous world? This arrangement supports earth system science, investigative case-based, field-based, and traditional "topic by topic" pedagogies. For more information about these, and other teaching pedagogies refer to the Starting Point pages within SERC. It is possible to search for resources using several pathways to encourage inquiry and discovery in a variety of instructional settings. Montana State grad students mapping Conor's Microsite. Provenance: © Museum of the Rockies. Here are a few resources to show you a sampling of what is in the Cretaceous collection. Examples will get you going and provide some general background information about the Cretaceous. Learn more about this project, Integrating Research and Education.